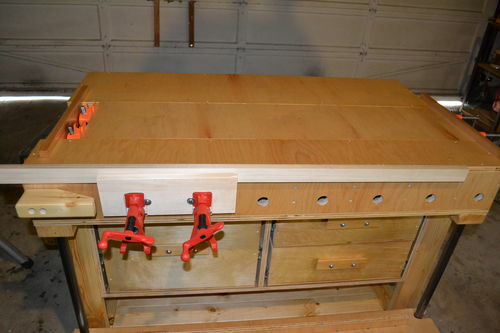 This is another version of John Whites Newfangled workbench from fine woodworking. I basically kept the idea of using pipe clamps as the method of wood holding, and the planing beam. The rest of it is mostly a departure. 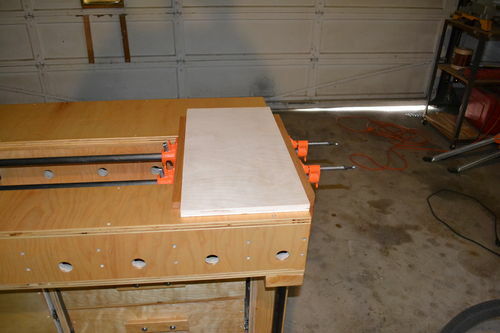 He built his using inexpensive solid wood, but without a planer or jointer, I thought I would try something different. My version has 3 separate 3/4” plywood boxes to serve as the top. The front and back boxes are torsion construction, and the middle box is open. The bottom of all three boxes is one piece of 3/4” ply. The boxes are also attached to each other with machine screws an t-nuts. 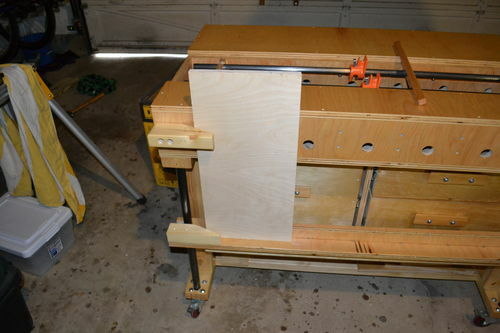 The front and rear boxes have a screwed on 3/4” plywood top (replaceable), and the middle top a series of unattached sections of ply in various sizes to facilitate use of the pipe clamps. 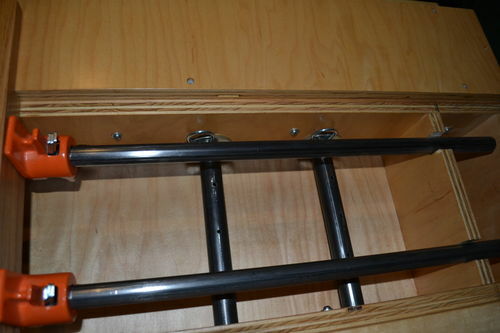 The base is made of screwed together 2×4s on 3” double locking casters. The base is attached to the top again with machine screws and t-nuts. The base also incorporates 3/4” black pipe to serve as the vertical supports for the planing beam. I used 3/4” pipe clamps to serve as the from “vice” (because I had them) and the rest for the planing beam. I used 1/2” pipes and clamps for the tail “vice.” The top is 7” thick and has holes drilled on 6”centers to facilitate moving the front clamps around to accommodate various sizes of wood for clamping. 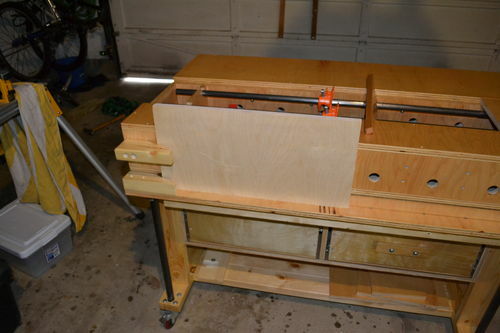 I added a 3” drawer plywood cabinet with full extension ball bearing slides to hold chisels, handplanes, routers, sharpening equipment, marking, measuring….. I can clamp wood several different ways, and here are the pics. It’s easier to visualize than to explain. The front pipe clamps adjust in and out for various thickness by moving a pin inserted in holes I drilled in the clamps spaced about 1 1/2” apart. The removable top pieces in the center section can also be used as sacrificial pieces for drilling and are easily replaced. They sit on the ledge of the center box. 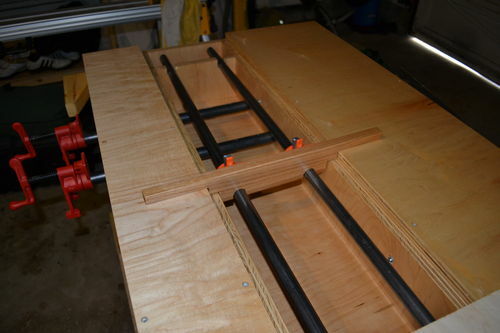 and allow the clamps to slide the length of the bench. The bench is really heavy, and stays solid even though it is on casters. I built it with maple ply, oak, pine, some other scraps, and a ton of screws, machine screws and t-nuts so that I could take it apart to replace anything that didn’t work. (I really wasn’t sure.) Three coats of poly should help keep coffee stains off, but we’ll see. Any questions you should watch the video of John White explaining his, but I would be glad to answer any other questions about mine specifically. I hadn’t heard of John White’s bench before but your post helps inform/inspire me. Thanks! A great bench, that you made! 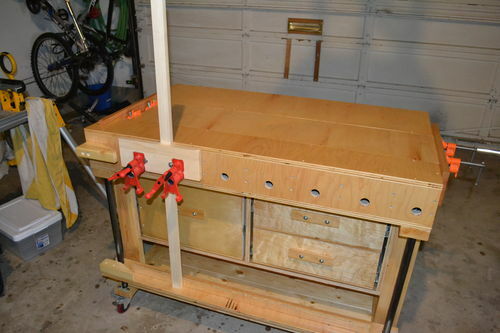 Whenever some time is left in the last months, I was planing around to build my version of the newfangled workbench. I bought the plan and made several different versions with sketchup. But I never thought about a combination with a torsionbox until now. Thanks a lot for your input! I will think about it. My first bench was new fangled bench and thought it lacked some rigidity. Your modifications of the designed should do much better. Looks like a great bench and you will get a ton of good use over the next few years and than you will get the bug to build a better mouse trap just like the rest of us! Nice modification you simplified the drilling of the holes for the ends. I built the original. I’ve considered this type bench before and you’ve NAILED it.